If you are downtown Ripley early in the morning, you’ve probably seen Downtown Development Executive Director Lee Johnston tooling around the square on a mission. Actually, he said, he’s hard to miss. He’s standing on the back of a bright orange golf cart dancing to “60s on 6” on Sirius radio. With him is a 25-gallon water tank. A water wand is in his hands. 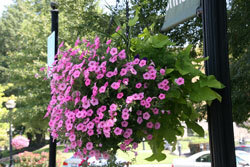 His mission is to thoroughly water the 30 hanging baskets of flowers that brighten up the square. It’s not exactly an early morning task that he signed up for. But it was his idea last year to ask members of the general public to commit $200 to sponsor the purchase of a basket, brackets, dirt and plants. When no one came forward, it became his job. And when the weather got hotter, it became a daily, two-hour task. “I give my wife, Dawn, the opportunity to water them on Saturdays and if I am out of town,” he said. Since he is color blind, Dawn also arranged and potted the plants at the beginning of this summer’s growing season.